The humanitarian community has technical definitions of famine and food security or nutrition emergencies: the Integrated Food Security Phase Classification (IPC). The classification requires good quality and coverage of food security, nutrition and mortality data. However, humanitarian emergencies and potential famines often occur in conflict contexts where the available data does not reach the high standards required for an IPC analysis. 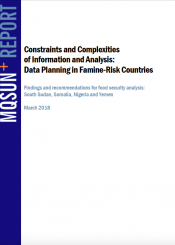 This means that data planning in famine risk countries may be unable to reach firm evidence-based conclusions. Collecting high-quality data is a triumph against the odds of security, access, and logistics constraints. Analyzing this information demands multisectoral, multi-partner efforts that include all the main stakeholders and puts the government in the lead. The fact that teams are regularly able to collect data is a testament to their ingenuity, determination, and dedication to ensuring that evidence-based approaches are used to direct humanitarian response to the areas of highest need. The limited technical capacity and high turnover of staff impede local, international, and governmental partners’ engagement in all stages of the IPC process. Partners are often reported to have a limited understanding of the process and are often not incentivized to participate. Time pressure and limited coordination between actors are impeding a more streamlined and collaborative data analysis process. The systems to identify hotspots are weak. Even when a hotspot is identified in an ad hoc manner, most systems are not sufficiently flexible to respond with a prioritized and in-depth assessment to ensure early response. Insecurity and access are key constraints to data collection. Geographical gaps in data are reported to be largely due to insecurity, issues with political authorization, and a lack of funding. Gender-sensitive analysis of the IPC data is not available. Gender disaggregated data sets are available for nutrition, however, the IPC process does not consider the significance of this data. These findings are based on interviews conducted with IPC or Cadre Harmonisé (CH) food security analysis teams in four famine-affected or threatened countries: South Sudan, Somalia, Nigeria, and Yemen.